This is my new release, to be officially launched in September 2013. The book has had many iterations, starting life as a Mills & Boon type novel called Barcelona Babies, way back in November 2011 during NaNoWriMo. When I decided I didn’t want to write short (50,000) novels, I extended it and it became Pictures of Love. 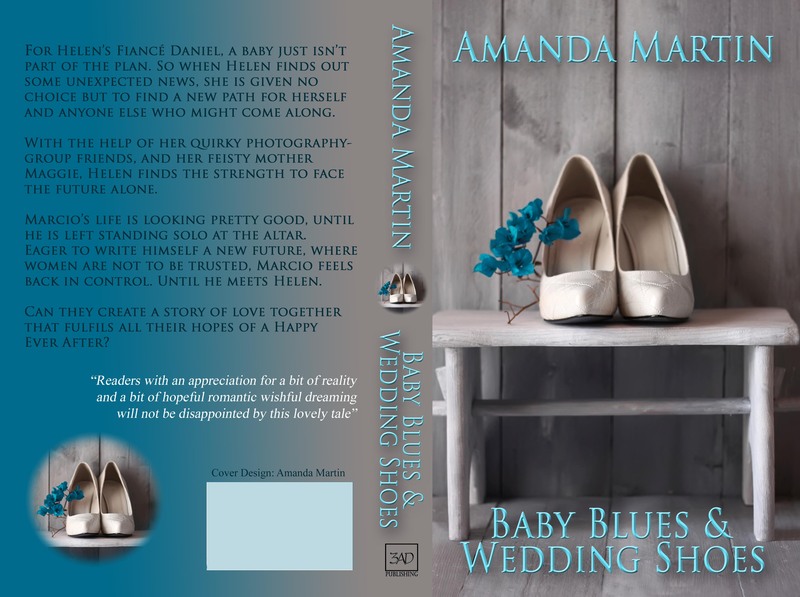 I felt the title didn’t really explain the book and its genre and a brainstorming session produced the current title, Baby Blues and Wedding Shoes, reflecting the two main themes of the novel: love and parenting. I chose to write this story for several reasons. I had been on a recent trip to Barcelona, and fell in love with the city, so wanted to base a story at least partly in that location. I am also mother to two young children (my youngest was only a year old as I wrote the first manuscript). I had post-natal depression with my second child, and I wanted to write about some of my experiences, in the hope that my honesty might help other mothers experiencing baby blues. Raising children is rewarding, amazing, but it is also hard. I like to write from the male and female perspective, because every story has at least two sides. For Helen’s fiancé Daniel, a baby just isn’t part of the grand plan. So, when Helen finds out some unexpected news, she is given no choice but to find a new path for herself and anyone else who might come along. With the help of her quirky photography-group friends and her feisty mother Maggie, Helen finds the strength to face the future alone. Marcio’s life is looking pretty good, until he is left standing solo at the altar. Eager to write himself a new future, where women are not to be trusted, Marcio feels back in control. Until he meets Helen. Can they create a future together that fulfils all their hopes for a happy ending? Wonderful, engaging story by a talented writer. Pleasantly surprising depth in a plot which one might have initially assumed would be a predictable meet-cute, boy meets girl, happily ever after. A more thought provoking story evolved than expected in the beginning. Author has a nice way with descriptive words which makes one feel nearly in the room. Readers with an appreciation for a bit of reality and a bit of hopeful romantic wishful dreaming will not be disappointed by this lovely tale. Well done. Dragon Wraiths is the latest novel I have written and yet the first to be published. My Chick Lit novels, like Baby Blues and Wedding Shoes, Class Act and Finding Lucy, took a long time to revise because they started life as shorter novels and needed extending. Dragon Wraiths is a Young Adult Fantasy novel, and the story came to me in a dream. I wrote the first 30,000 words but abandoned the manuscript, as I wasn’t sure where it was going. Then I learnt about the Mslexia Children’s Novel competition and I decided to finish and enter Dragon Wraiths (hence why it was the first completed novel: I work well to a deadline). Dragon Wraiths is written in the first person present (I walk rather than I walked or she walked). It is the first and only thing I have written in the first person, as I prefer the scope of writing in the third person. After I had written my first draft I read Hunger Games, also written in the first person present, and it confirmed for me that I had made the right choice for this novel. Leah was sixteen, so the book became a Young Adult book. I didn’t write it for that market specifically: I wrote it because it demanded to be written. Dragon Wraiths was long-listed for the Mslexia competition, but didn’t make the shortlist. Encouraged, nonetheless, I sent the manuscript to a range of Beta readers and their enthusiastic response encouraged me to try my hand at self-publishing. I knew I was unlikely to find an agent for the novel because it is long for a YA book (110,000 words). Dragon Wraiths was published early in 2013 and has made steady progress since then (it is currently doing well in Germany!) I have had a wide range of reviews from 1 to 5 star. As it is my first published novel I am happy with that range of response: at least it isn’t bland! It’s the day before Leah’s sixteenth birthday. Instead of planning the perfect party she’s stuck in a shabby B&B in the middle of nowhere. She’s not worrying about pimples and presents: she has bigger things to freak her out. Like her Mother’s dying words telling her she will die on her sixteenth birthday. Spending her teenage years escaping from falling trees, burning buildings, killer bees — and the unseen enemies trying to murder her. Or falling in love with a boy who won’t admit she exists, even though they’ve been on the run together for months. I really enjoyed reading this story. The author’s writing style was very immersive, and I felt like I was experiencing the ride along with Leah, starting with the horrible tragedy of her parent’s death. Amanda Martin has created a fantasy world unlike any I’ve ever read. The world starts out relatively normally, though you know something is strange, and as each detail builds, as Leah discovers each new fact, it fits together seamlessly. An engrossing read. Looking forward to reading more from this author. This is a wonderful romp for the YA audience that definitely crosses over to Adult (which is me!). Amanda writes in a wonderfully emotive and poetic yet also pacey style and I was at once absorbed and engaged with the central character. I wouldn’t call myself a fantasy fan by any stretch (the work Tolkien just makes me want to snooze…) yet I was completely onboard with this parallel world and I found the transition between them, and the entire storyline credible. I found a Harry Potter-esque sensibility to the author’s use of intriguing devices and methods for the real and fantasy worlds combining – but this is not to say there is any pastiche going on. Thoroughly recommend the book – and am hoping there’s a sequel on the cards! Two-Hundred Steps Home is my novel in installments, written daily here for the blog. I came up with the challenge on New Year’s Eve 2012, as a way to force me to blog more frequently. THSH has taken on a life of its own and currently (August 2013) stands at 165,000 words. It follows the life of Claire, a marketing director plunged into a life of hostelling and upheaval by her manipulative boss. A pantser at heart (someone who writes by the seat of their pants) I don’t really know where this novel is heading. I’ve had ideas for the finale but Claire keeps changing the direction. When the year is over, I hope to take the raw material written in daily chunks and whittle it down to a novel (or maybe two). It’s on the very long list of projects. So far there are seven volumes available to download for free from Smashwords, Barnes & Noble and other online providers. Each monthly volume is 20-25,000 words long. Claire’s life revolves around Starbucks, stilettos and her career as an Advertising Account Director for AJC. That is until her boss Carl decides to send her on a mission to visit every one of the 200 YHA hostel in England and Wales as part of a marketing campaign. More used to five-star spa resorts than ‘flea-infested hostels’ Claire only takes the assignment to save face. It becomes clear to her the ‘mission’ is a ruse to make her resign. Together with her hated 1980s Skoda Estelle – another part of the assignment – Claire sets off for Berwick-Upon-Tweed and a new way of life. Will Claire get used to sharing a room, going without skinny lattes and travelling in an Eastern European rust bucket. More importantly, will travelling the length and breadth of her home country enable Claire to forget her lost love Michael? In this first episode Claire develops from a rather selfish and decidedly unaware woman into someone who is beginning a journey to self awareness. The settings are a delight to anyone familiar with the hostels and the countryside around them. The settings in this second episode are every bit as good as the first. Josh adds an element of mystery and Claire is beginning to discover facets of herself she simply wasn’t aware of and becoming a good deal more likeable as a result. More complications in Claire’s life continue to push her along a path that seems to be good for her. Meanwhile, we learn a good deal about Josh and connections. Claire is beginning to resolve some of her issues under the pressure of troubles affecting members of her family. The attempts by her boss to persuade Claire to resign seem almost unimportant compared to her current experience. Gentle, wryly observed and well written. I’m looking forward to seeing how she copes with her proposed hostelling companion. I’m so glad you want to read it! I am writing the novel daily on my blog, so you can catch up by going back to the post from 1st December and read on from there. The volume containing all 31 instalments won’t be available until I finish my challenge, on 31st December. Even I don’t know how the story ends!